Sometimes something that sounds as simple as trimming hedges can turn out to be quite a challenge. We enjoy challenges at Burley Boys and pride ourselves on the fact that we have never turned down a job because we thought it was too much of a challenge for us, or that we were not equipped enough to handle it. No matter what the challenge … we have the equipment and the experience to take it on. 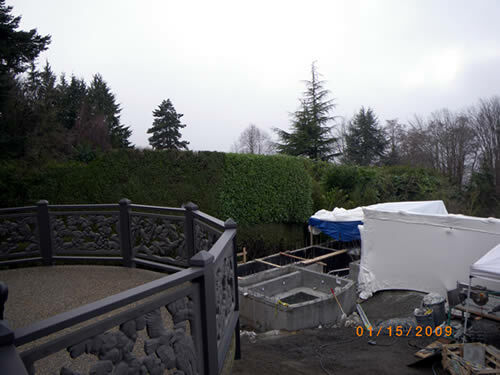 A Vancouver residence having landscaping done whose owners wanted the hedges trimmed into shape before the landscaping was completed. This hedge was more than 20 feet wide and mostly on the neighbour’s property. 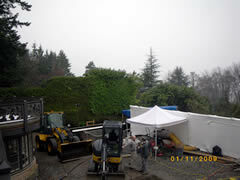 It was a sloping property more than 20 feet high. The photo above was the first picture taken, used to show the neighbour’s the height we were intending on cut the hedges to, and get their permission before starting. 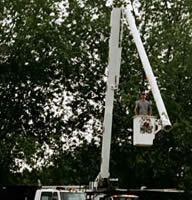 We were able to use one of our lift trucks in the back yard to complete the first half of the job, but the second half had to be climbed through. It wasn’t easy, it was challenging, and we’d do it again. The picture above shows the job as completed. We are not real estate appraisers, but as you can see, this was a drastic change and the cost of the work could have easily been more than offset by the increase in property value.